Home / GOVERNMENT/POLITICS / Opinion/Editorial / Politics of money in Nigeria: Is this the only winning strategy? Politics of money in Nigeria: Is this the only winning strategy? The history of Nigerian politics is highly entangled with money politics. In fact, the term‘politics’ can be used interchangeably with ‘money’. The size of a politician’s campaign ground can be an effective yard stick for measuring his wealth and influence not how much the people believe in his leadership abilities/potentials. Time is money to the electorates, ears are rented. They chant aloud and sing praises when they clearly can’t understand or hear the campaign speech being delivered by the candidate. This doesn’t make them different from the Nollywood actors in Nigeria today. Democracy in Nigeria has been heavily battered; the perception of Nigerians about political campaigns is more than being mentally ill. An average Nigerian sees the election period as a blatant opportunity for him to grab his share of the ‘national cake’. Earlier this year, newspapers widely reported the massive sale of houses and other landed properties in top cities like Lagos and Abuja belonging to politicians at give-away prices. This is due to the huge financial demands of political campaigns with the electorates stretching permanently opened hands to them in readiness to receive cash and other material resources from competing sides. This is could be likened to the Game theory in political science where both parties aim to win by exploiting the weakness of the opposing sides. The politician recklessly spending his hard-earned funds isn’t dumb or probably that magnanimous. The electorates constantly demanding for financial resources are not smart either because they will pay back at an unimaginable exploitative interest rate over the next 4 years at the success of the candidate. Although, there is hardly any country in the world where instances of bribery or political corruption are not present in their national politics. The case of Nigeria is alarming because the image of democracy is being severely dented. Researches on Africa’s post-colonial history, have however shown that in Africa, corruption is an institutionalized and a systemic practice affecting not only the post-colonial state itself, but also the majority of the citizenry. For these Leaders to blindly endorse President Goodluck Jonathan against their fellow Yoruba man, Prof Yemi Osinbajo who is a running mate to the All Progressive Congress presidential candidate Muhammadu Buhari, then the pay was worth the new enemies and the future risks. This is business. As long as the profits exceed the costs then it’s a successful year. I am sure this is part of what President Goodluck Jonathan was advocating for when he advised the citizens on entrepreneurship. It takes improved and sensitive entrepreneurial abilities to deal with politicians a times. This is not only an abuse of democracy and power but also a public slap on the face of the followers of these so-called traditional rulers. Voting is a civic right that should be respected; no leader reserves the right to impose a certain candidate on any electorate. This certifies the stand of the Awujale, Paramount ruler of Ijebuland, Oba Dr. Sikiru Kayode Adetona and others who gallantly refused to be politically bought. Independent-mindedness and critical nature are important features that differentiate a South-West person from a Northerner who agrees to die in a terrorist operation without questions. This could be attributed to the success of indirect rule in the early 90s. This article portrays too much subjectivity as regards the incidents of bribery but the beauty of rumours in the context of Nigeria is that they always end up with the strongest elements of truths which are revealed over time. It was widely read that President Jonathan also stormed Lagos with wads of dollar notes, his campaign strategist made a perfect suggestion due to the high value of the dollar as compared to naira which is around N220 per dollar. That was big enough to buy the conscience of the electorates in Lagos. It is so sad that the kind of politics we play in Nigeria hasn’t reached its maturity stage, in the real sense we play the politics of the street, we trade insults rather than discuss issues. A close study of the Facebook page of the lousy campaign manager of President Jonathan, Fani Kayode sums it all. His close enmity with Governor Rotimi Amaechi is enviable. It reminds me of our secondary school days when you always criticize a female classmate just to get her attention. Both of them should probably settle their hidden crush on each other outside politics. I am not straying away from the issue of money as it seems. PDP clearly went to the election transfer market to shop for Fani Kayode. That reminds me of the game of football. Diego Costa in the last Champions league campaign played and scored against Chelsea football club of England but today he is the torch-bearer of Chelsea FC. Fani Kayode used to be vehemently against the People’s Democratic Party and earlier this week, APC showcased on the newspapers one of his top criticisms of the incumbent president before he defected to the ruling party. It’s a simple game of Fani Kayode weighing where he could eat more and then deciding. This further confirms the comic statement made by the former military head of state, Gen. Ibrahim Babangida (RTD) that if you want Fani Kayode to dance and sing for you, simple give him ‘food‘ to eat. These are terrible models of leadership consciously and unconsciously influencing the lives of us youths. Another point worthy of note is the romance of the leadership of the People’s Democratic Party with the Nollywood actors. 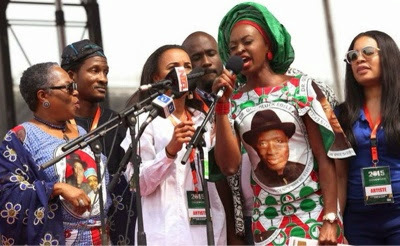 When I saw the pictures of President Jonathan’s campaign in Asaba, Delta state on the 5th of February 2015 and I saw prominent Nollywood stars like Ramsey Noah, Monalisa Chinda, Kate Henshaw, Ini Edo, Joseph Benjamin, Daddy Showky (singer), Patience Ozokwor,Omoni Oboli, Fred Amata .Nollywood movie producers Zeb Ejiro,Moses Ewang, Kingsley Ogoro, comedians like Gordons, Omobaba, etc, I knew something bigger than my imagination must have driven them out despite their acclaimed tight schedule. Particularly the way Ramsey Noah with his fresh skin was chanting under the scorching sun was an indication of a ‘personal‘ motivation. Well what do you expect, since he was paid for the show, he decided to do the best job of an actor. Much respect to Ramsey Noah and others anyway. A times the country’s economic state doesn’t permit you to uphold your integrity. I am sorry if I am taking this personal. It’s not my intention to engage in any sort of character assassination but here is my question. How come these Nollywood stars developed an interest in Nigerian politics over the night? (Aside Kate Henshaw who made a failed attempt) What happened? Did Providence make a revelation to them either through a dream, trance or vision? If you follow them up on the social media or other media interviews, some of them have never mistakenly mentioned the term ‘politics’ in decades even as a result of malapropism. I will not fail to mention the Ekiti state ‘rice strategy’ that ushered in Gov. Ayo Fayose. He strongly tackled the issue of hunger during the campaign but what is the essence of giving an able-bodied jobless young man the best food at a 5-star restaurant when you know he will be back hungry the next day. His joy will only be momentary. That is the plight of the Ekiti state people and currently they have started feeling the heat. Earlier this year Governor Ayo Fayose threatened to sack Ekiti workers who fail to honour the campaign of President Jonathan coupled with his recent threats on the traditional rulers. This is an aberration to civil rule and local customs. It’s high time our leaders treat us as sane people and not bombard us with cheap gifts, false hopes like patients going through a rehabilitation process. The issue of integrity in Nigeria seems to be washed away gradually by the erosion of money. Everybody has a price tag, prices only differ. Once you meet the asking price, the individual accepts the contract e.g. the case of the permanent silence of Reuben Abbati (Special Adviser on Media and Publicity) who used to be an unrepentant critic of the current administration. He was previously a newspaper columnist and the chairman of the editorial board of the Nigerian newspaper The Guardian from 2001 to 2011. Finally, the ‘money politics syndrome’ is close to raising its ugly head in deciding the winner of the forthcoming presidential elections in Nigeria. If you follow opinion polls online as well as intellectually accurate surveys done by reputable organizations, you will realize that the odds favour the presidential candidate of the All Progressive Congress, Gen. Muhammadu Buhari (RTD) but that is on paper. In reality, close participants of Nigerian politics will place their bet on President Goodluck Jonathan to retain his seat due to the national financial resources at his disposal. It is just a matter of you displaying your price tag on your shirt and getting paid for. The outcome of the forthcoming elections now appears so scary as the electorates are scared of another four solid years of political and economic oppressions. We are tired of reading news of missing billions and fake promises. The plight of the masses is so pitiful. We need to stand up against this trend of money politics which is an entry point to unscrupulous political elements in power. Let us endure the economic hardship of resisting attractive bribery items as a small sacrifice for a greater future for the country.